You may think you’ve eaten some weird stuff—but how about food that fights you back? When you wander through the narrow food alleys of Seoul, which are lined on both sides by small restaurants that specialize in a specific dish or two, the most disconcerting sight, apart from the weaving mobs of soju connoisseurs that materialize after midnight, may be the tanks of octopus set right up to the sidewalk, water darkened by the occasional stray ink jet, hundreds of pinky-gray tentacles rippling like something out of a tidepool gone very, very wrong. A single octopus, dramatically set off by the theatrical lighting at the Monterey Bay Aquarium or documented for the Discovery Channel, is a majestic thing, a masterpiece of rippling muscle and balletic grace, beautiful even in the way it rips open a scallop or transports an unsuspecting fish into its maw. (Octopuses—not octopi, no matter how passionately your high school biology teacher may have corrected you—are usually solitary creatures, preferring the safety of rock crevices to the company of their peers.) An accumulation of many octopuses, on the other hand—an alien collective that the gill-bearing forefathers with whom we still share so much DNA were undoubtedly hardwired to avoid—may inspire nothing less than screaming, full-bore panic. When you summon up the courage to walk into a Korean octopus specialist, whether in Los Angeles or Seoul or Flushing, you’ll probably end up with a huge, steaming platter of nak ji bokkum, a spicy, brick-red sauté of octopus with chile paste and vegetables. Even if you fear the octopus, you’ll probably be okay—the octopus here is just a mild chewy thing, a non-threatening vehicle for the potent sauce. But if you wink at somebody the right way, speak passable Korean, or spot a likely euphemism on the menu, you may luck into a plate of san nak ji, live octopus tentacles, which is one of the most alarming dishes in the world. I’d had san nak ji in L.A.’s Koreatown, of course, where it ranks with boiled silkworm larvae, army-base stew, and blowfish among the Korean exotica that any self-respecting aficionado is expected to seek out and enjoy. The lengths of chopped tentacle, which are not technically alive but still have a functioning nervous system, were motile, barely, but hardly twitched when you dipped them into sesame oil and popped them into your mouth. I had been expecting a spectacle like the one in the Korean thriller Oldboy, where one of the characters suffocates while eating the dish. But my first real san nak ji, offhandedly offered as an appetizer in a Seoul barbecue joint, was the Alien vs. Predator of the food universe, a small platter an inch deep with what appeared to be either severed fingers or writhing worms, fat wriggly things that climbed out onto the table and seemed to battle one another for position. When you tried to pick them up with your chopsticks, they wriggled up them nearly to your knuckle. 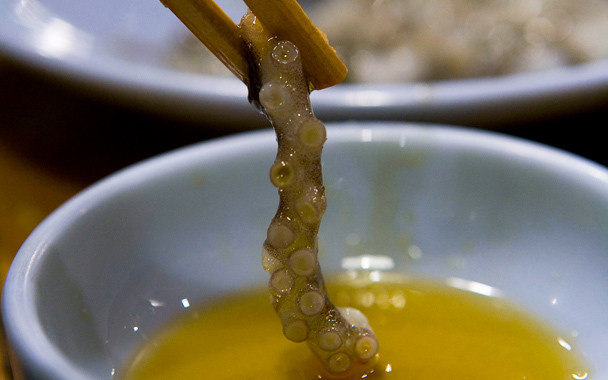 And for the first time I appreciated the strategic importance of the sesame oil–salt dip—not just because it tasted good, which it did, but because the suckers on the tentacles are still fully functional, and the coating of slippery oil prevents them from maintaining their death grip on your tongue or the roof of your mouth. San nak ji is food that fights you back. Is san nak ji delicious? It kind of is, actually—meaty, slightly nutty, definitely alive, as fascinating a way to ease down a bottle of soju as you can imagine. The dish certainly gets one’s attention. But still, all things being equal, I don’t see it replacing cocktail peanuts any time soon.